The Ladies’ Champion of Champions was played at South Oxford BC on Saturday 20th September 2014 with Caroline Campion of Banbury Central the overall Champion. Unfortunately there were only 14 ladies singles champions represented in this competition but hopefully more will be encouraged to take part next year. 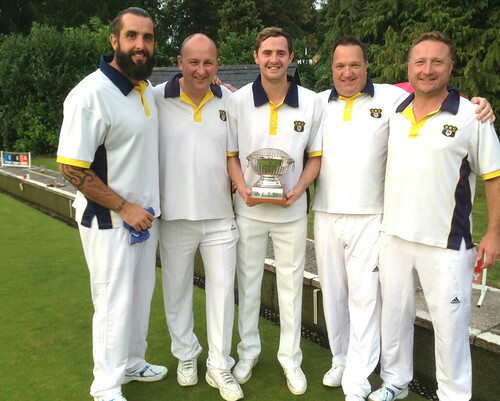 Last Saturday was the Summertown Trophy final’s day, where the top 10 qualifying teams from across the County battled it out at Banbury Chestnuts for the £700 prize money – all teams playing each other over 7 ends in a round-robin format. After the first 4 games it was Carterton leading the pack with +19 shots, closely followed by the 2 Headington sides, which included last year’s winners. However after lunch, the defending Champions Headington A struggled to win a game, replaced by the 2012 winners Banbury Borough who climbed above them. After drawing with leaders Carterton, Headington B managed to win all their remaining games to put themselves in an unbeatable position and undefeated throughout the day. The Headington team made up of Mark Charlett, Jason King, Nathan Lewis, Ian Henwood and John Philpott (on the winning side for the second year running) went on to amass a record +41 shots, 30 ahead of their nearest rivals. The battle for second and third place saw an exciting climax with the Borough, Carterton and Witney Town all in contention going into the last game and separated by just 3 shots. With Banbury Borough clinching a 5-5 draw against rivals Carterton on the last end, and Witney Town losing their last game by 4 shots, it left Borough to claim second prize and the Astall Ley trophy, with Carterton finishing in third. Banbury Borough/Bloxham played Shiplake BC at City and County on Sunday 14th September in the Top Club Final. Final score of 2-2 resulted in a win for Borough/Bloxham on shots with a total of 78 = 58. The annual match of County Ladies v County Men took place on Thursday 11 September at Banbury Borough BC. Always looked forward to and played with plenty of lively and friendly banter. A close match with the ladies losing by just 3 shots (or maybe the men winning by 3). This year’s League Cup final between old rivals City & County A and Headington A came down to the last wood on the last end, in a dramatic finish to this year’s competition. At the half way stage City and County were comfortably ahead as both Paul Comley and Alan Ley’s rinks opened up good leads over their Headington opponents. Howard Watts’ four kept the Headington side in the game though, with their 12 shot lead reducing the deficit over all to 8 across the game. As the daylight started to be replaced by the floodlights at Kidlington, Headington slowly turned up the heat and reduced the gap to just couple of shots on the game, with the lead then regularly switching between the 2 sides. With 3 of the 4 rinks having finished and Headington 1 shot ahead on the game, a huge gathering watched the closest ever League Cup final draw to its conclusion. City and County’s Paul Comley, who’s rink had battled well to a good victory, eventually finding no way through and unable to win the last end that they needed. Despite City and County winning on 3 rinks, it was Howard Watts four of Dean May, Ian Kibble-White, and Gary May that helped Headington secure a third League Cup title in 4 years with their 18 shot victory. City and County A 63, Headington A 66: P Comley 21, I Snowdon 11; M Hancock 16, M Charlett 15; C Earl 10, H Watts 28; A Ley 16, J King 12. Oxfordshire Under 25s finished off their season in the Four Counties Top 11 competition at South Oxford on Sunday. The competition, based on the national Top Club, was played at South Oxford BC between Under 25s teams from Surrey, Buckinghamshire, replacing Berkshire, Middlesex and Oxfordshire. This is the third year that the event has been hosted by the Oxford club and once again proved to be popular amongst the players and supporters alike. Surrey made it a hat trick of victories beating Bucks 3-2 in the final with Oxon, for the second year defeating Middx 4-1 in the third/fourth place play-off. Featuring a few changes from last year’s team, the Oxon players were drawn against an ever strong Surrey team in the first game and can consider themselves unfortunate to lose 3-2. Jamie Wilkinson, a last minute switch to the 2 wood singles, played some fantastic stuff but the strength and experience of Charles Bruder proved too much for the Banbury Central player in his first ever two wood match so first blood to Surrey. George Schwab got off to a good start in the four wood singles against Charlie Souter but when leading 16-13 dropped a four, three and a single to give Surrey a two point lead with three disciplines still playing. Captain Lee Wilkinson making his last appearance for the Under 25s due to age picked up where he left off last year in the fours. With Brandon King, Bradley Squires and Orren Bennett Wilkinson cruised to a 28-6 win over Matt Hayes. Sam Muir, also in a junior shirt for the last time showed his experience and skill as he skipped his triple of Ben Dickson and Dan Swanson to a crucial win over England star Dan Morris to level things up at 2 all. This left the pairing of Sam Watts and Shane Cooper with the job of securing an Oxford final appearance for the first time. Up against James Freemantle and Matt White the Oxon boys were behind up until 14 ends but dug in to go into the last end, one up. A single dropped meant the whole tie would be decided on an extra end which went Surrey’s way meaning for the third year running Oxon would play Middlesex in the third/fourth play-off. Bucks, making their first appearance in the competition beat Middx 4-1 to set up the final with Surrey. Fielding an unchanged eleven, Oxfordshire went one down against Middx in the afternoon after Jamie Wilkinson lost by two to Kai Matthews in a two wood game which went the full 21 ends. Wins in all of the other disciplines saw the day finish positively although it was in everyone’s mind that with a fraction of fortune it could have been the final they were contesting. All in all this was another great day of bowls played in the best spirit of the game and a fitting way for Wilkinson and Muir, along with Dan Morris and Matt White of Surrey to finish their junior careers. Oxfordshire men led from start to finish against Middlesex at West Ealing on Saturday to secure the win required to lift them from the foot of the Home Counties League table. Needing seven points to avoid finishing in last place the much altered team made sure of fifth place with a 118-102 shot and 16-6 points victory in a game played on a heavy, tricky surface. No less than ten changes had to be made to ensure that Oxon travelled with a full team but all that played will say that it was worth the effort. Colin Whitehead’s four of Paul Demczak, making his first appearance in an HCL game, George Weedon and Chris Earl took top rink by beating Andy Knott by eleven. The glasses however looked for a long time to be going to Kevin Alder with club mate Paul Skidmore, Nigel Galletly and sixteen year old Orren Bennett but they were pegged back towards the end to finish just ten up on Paul Fuller. No more than four shots separated the other rinks either way. Shane Cooper, skipping a county rink for the first time was probably unlucky to finish four down to Paul Cater on his home green. Cooper was accompanied by the second sixteen year old in the team, Dan Swanson. Richard Barnett and his men fought well to finish just one behind Matt Larman while John Hardie led from the start in the lowest scoring game to finish four up on Brian Elbourne. Alan Ley was behind in the early stages but battled well to get their noses in front at fifteen ends and were all square going into the last however a four saw opposing skip Roger Milton take the game. Watlington’s Mark Plested was awarded his full county badge at the end by County Secretary Steve Tolhurst. Played at City and County BC on Wednesday 27th August the Officers’ Cup final was won by Katherine Hawes with Helen Kingsley (both from City and County) the losing finalist. The second ladies county finals day was played today at Oxford City and County featuring the pairs, triples and under 25 singles. 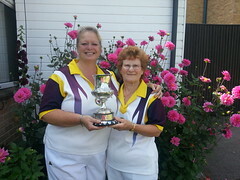 The pairs finals saw Myra Lewis and Gail Gilkes (Oxford City & County) beat Carole Galletly and Caroline Campion (Banbury Central) in a close thrilling final. The game finished all level and had to go to an extra end. 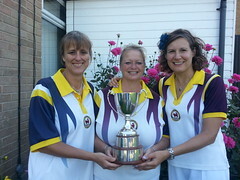 The Banbury Central pair held the shot but Gail Gilkes fired the jack to the back of the rink and then drew the winning shot to claim the county title. 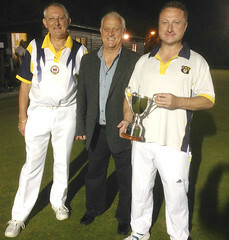 The county triples final involved two triples from the host club. Donna Knight, Gail Gilkes and Katherine Hawes had a 7 shot victory over Sue Mayo, Myra Lewis and Jeanette Berry. The game was close at the start with Hawes’ triple pulling away to take the title. 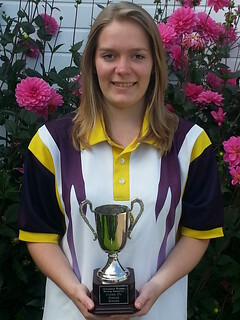 In the under 25 final, Katie Glenn (Oxford City & County) beat Amy Stone (Banbury Central) 21 – 15. Both girls played some excellent drawing bowls with Glenn breaking away to secure victory. Oxfordshire men beat Buckinghamshire by four shots in their penultimate Home Counties League game of the season at Kidlington on Saturday. Despite losing on four rinks the results of Chris Earl’s and George Schwab’s respective fours saw the team home 101-97 and 14 points to 8 in this bottom of the table clash. Several enforced changes to the team saw Earl move to skip in place of the absent Ian Snowdon and romp home by fifteen shots against Ray Gaskins. His re-arranged four of City & County team mate Paul Comley, Banbury Central’s Nigel Galletly and last minute call up, county secretary Steve Tolhurst found the green to their liking to win fourteen ends and finish highest winning rink over Gaskins who himself is rumoured to be an Oxon player next season. Earl was pushed all the way for top rink by Schwab’s under 25s four. The Banbury Borough man, with Banbury Central star Shane Cooper at three, Joe Woodward on his home green and Sam Watts of Watlington won the first seven ends to establish a ten shot lead over Don Savage which opened to thirteen at the end. This is the second time an Under 25s rink has won well against Bucks in the HCL which shows once again the strength in depth being created in the county. Elsewhere Headington skips Ian Henwood, Jason King and Mark Charlett all lost by 2, 7 and 8 respectively. Bicester’s 16yr old Dan Swanson and Ian Kibblewhite of Headington both made their debuts for the county on Henwood’s rink. The sixth rink skipped by Alan Ley lost by seven. Oxon face Middlesex at West Ealing in the last game of the campaign next Saturday. Seven points would see us climb from the basement position to fifth in the final table. Nineteen points would see fourth place taken from Middlesex themselves.